The early history of life in lakes. Through the study of several Archean and Proterozoic lacustrine localities I have been focusing on the conditions under which the stromatolites formed, the diversity of stromatolite forms, the factors that might have affected stromatolite shape, and the factors that affect stromatolite distribution. Paul Buchheim is a collaborator on this research. 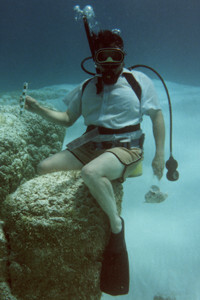 Stromatolites undergo intervals of increasing and decreasing diversity and abundance. With stromatolites, the waxing and waning of diversity is most prominent during the last 2000 million years of the pre-Phanerozoic (from 2500 to 544 million years ago). The diversity patterns that I've established can be broadly correlated to some of the major changes that took place on the pre-Phanerozoic Earth. This work is related to the pre-Phanerozoic study of lacustrine stromatolites. Lacustrine stromatolites are known from many ancient Cenozoic lakes systems around the world. In some systems, like the Eocene Green River lake systems, stromatolites are prominent biological features. The conditions under which the stromatolites formed, their interactions with paleoclimatic factors, and factors that affect their lamination and overall shape are foci of this study. Paul Buchheim, Leroy Leggitt, and Kyung Sik Woo are collaborators on this research. Based on studies on stromatolites preserved in chert from the approximate 2000 million-year-old Gunflint Formation, my graduate student, Mike Sommers, is developing criteria for the recognition of biogenicity in stromatolites based on characteristics of the laminae. I am conducting research on microfossils from several pre-Phanerozoic formations, in particular the Gunflint, Kingston Peak, and Doushantuo Formations. This research involves establishing the microfossil's biogenicity, syngenicity (microfossil is the same age as the primary sediment), taxonomic affinity, and ecological context. These results are then added to a developing picture of microbial evolution on the early Earth. Life during Neoproterozoic snowball Earth times. What happened to life during snowball Earth times? In collaboration with Frank Corsetti and David Pierce, we are investigating the stromatolites and microbial fossils found in carbonate beds occurring within glacial diamictites of the Kingston Peak Formation, eastern California.